Near the east boundary, north of the entrance - There are two WW1 burials, Thomas Baker being one. Involvement Australian Flying Corps, Captain, SN Officer, No. 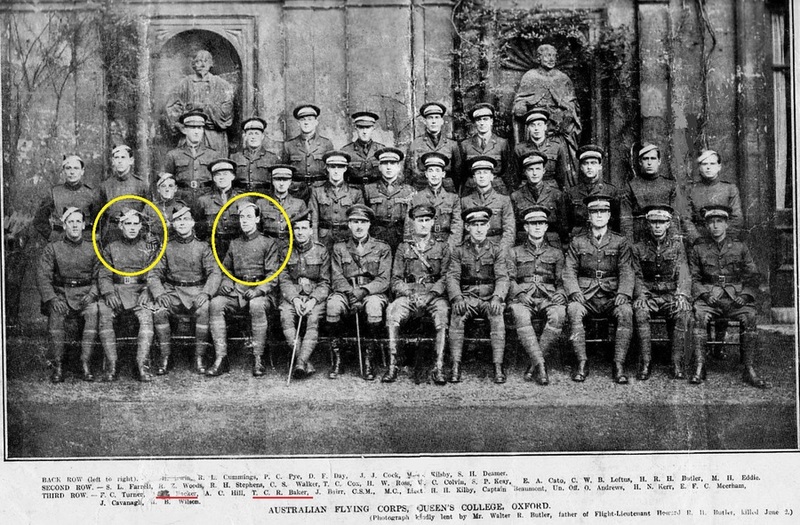 4 Squadron, Australian Flying Corps, "The Last Hundred Days"
After the war Mr Stanford Howard late Lieutenant, 4th Squadron, Australian Flying Corps wrote an article about the exploits of Thomas Baker which was published in the School Magazine. … He grew utterly fearless, and in his wonderful confidence in himself and his machine he went into such corners from which only miracles could save him, and these miracles he achieved. After 2½ months with the fighting squadron he had seven Huns to his credit, and also two hostile observation balloons. His tactics in the air showed great originality, and on several occasions he saved his patrol from destruction by timely moves and counter-moves. He was the friend of all inexperienced pilots, because they knew that with Baker leading they would not be left long in any predicament. In a scrap, or ‘dog-fight,’ as we called them, his machine could be seen darting here and there, always to the help of those in difficulties. For his excellent work he was awarded the Distinguished Flying Cross, and was also recommended for the D.S.O., but his untimely end prevented the award of the latter, as the higher command desired to watch his development still further before granting him this honour. He met his death in the defence of others from the attacks of greatly superior numbers, and he went down, as might be expected, colours flying, fighting to the last. His total bag of Huns was 15 machines and four balloons, and it is a splendid record. Let me say in conclusion that no news was received with greater concern by the pilots of our squadron than the news of the death of Richmond Baker. He left a splendid memory, of which his family is justly proud and in this pride all South Australians should share. From the dogfight, which followed, three of our machines failed to return. One of our machines (supposed to have been piloted by Capt. BAKER was seen to land and turn over on it’s back close to the River Eacaut about 10 miles North of TOURNAI. At this time (Novr. 4th) the enemy were retreating in Belgium and the exact positions of his front line were not known to the Squadron. Later in the same day a car went out from the Squadron to locate the crashed machine but could not reach it owing to the enemy line being slightly West of the River Eacaut at that point. No subsequent information regarding this officer has come to hand either from repatriated pilots, or through enemy channels. Thomas Baker, Born May second, 1897 was brought up in Smithfield South Australia. Thomas went to Saint Peters college and loved sports. He additionally had a love for aviation. Preceding the war, he served in the Cadet Corps. On the 29th of July 1915, Baker joined the AIF (Australian Imperial force), designated to the first Fortifications of the sixth Field Ordnance Unit. His training was finished in Adelaide. 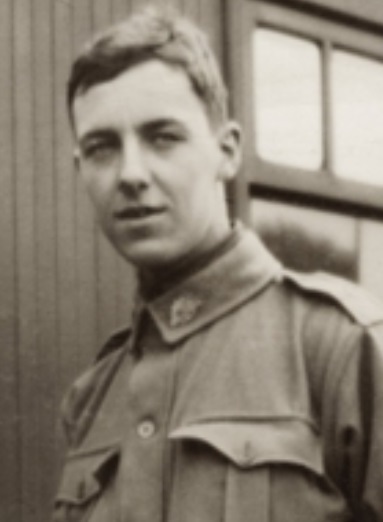 It was on the 22nd of November 1915 that he left Melbourne on his mission to serve in the great war. 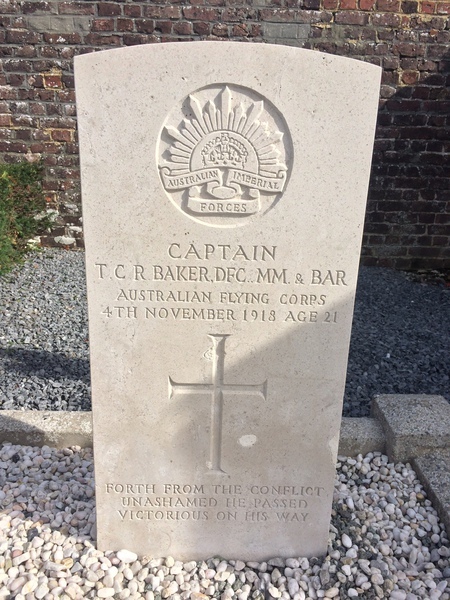 Baker was appended to the 16th Field Gunnery Unit on the 26th of December 1915 in Toura. The battery prepared in Egypt and after that set out to France on the seventeenth, they left to participate in the main battle of Somme (battled between July 1, 1916 – November 18, 1916). The battle for Pozieres and Mouquet Farm needed ordnance trades, Baker and the sixteenth Battery managed to power through the two battles. Guedecourt was assigned to be the HQ for the AIF that winter, on the eleventh of December, 1916. He was swapped out to a Forward scout group close Guedecourt to support the accuracy of weapons with just a field telephone for communication. Thomas was under substantial fire by some riflemen that took out his telephone, he repaired the harmed telephone line, and repaired communication. This act earned him a Military Award, to which he later earned the Military Bar in an occasion the next year. In Messines on the evening of the 21st of June 1917, Baker had been reconnected to his Battery after he recovered from trench fever. The disguise on the No. 1 pit had burst into flames, putting around 300 rounds of shells of high explosives in threat at around 3:30 pm. B.S.M. Creek had requested volunteers to help him in putting out the fire, to which Baker and three other men reacted to instantly. Every one of the five men put out the fire utilizing water assembled from a nearby well and in shell openings. Baker and the three other men, including Darker, Cleric, and McSweeney, were each granted the Military Decoration Bar for this demonstration. In August 1917, Baker had started to look at a career in the Australian Flying Corps, after witnessing syncronized aerobatic pilots in real life. In September 1917 he was exchanged to a workman position for the A.F.C., before long, he experienced flying and prepared for the No. 5 Flying Squadron in Britain. He finished his first solo trip in 1918. Thomas went on leave from his preparation in Britain from the 31st of August, re-joining on the fifteenth of September. He graduated on the fifteenth of June 1918 as a pilot of a Sopwith Camel and was then commissioned as a Second Lieutenant for the No. 4 fighting Squadron. Baker in the four months of battle Between June 23rd and November fourth Thomas had shot down 12 enemy aircraft in his Sopwith Camel and his Sopwith Sharpshooter. In October, Baker wrecked two unfriendly aircraft, after two weeks his flying skills excelled, earned him his Distinguished Flying Cross. His last flight was on the fourth of November, over the city of Ath, Belgium, where he and a partner were in battle when Thomas was tragically shot down and revealed lost without a trace. His demise was later confirmed and grieved by his squadron and family. 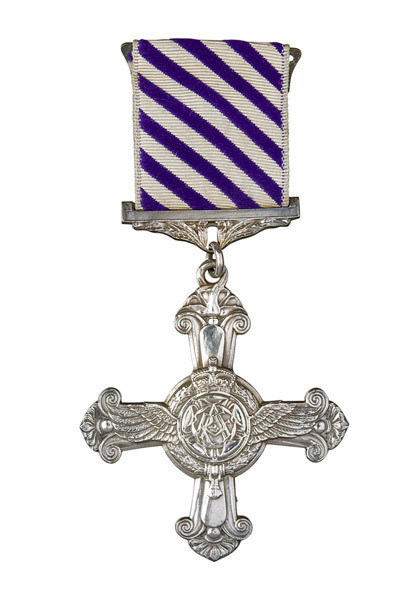 Thomas was given several awards after death, such as the Flying Cross on the 23rd of May, 1919. Thomas Charles Richmond Baker (1897-1918), was born on 2 May 1897 at Smithfield, South Australia. These days it is a northern suburb of Adelaide but in 1915 it was farming country. He was the eldest son of Mr Richmond Baker, schoolmaster and farmer, and his wife Mrs Annie Martha, née Gardner. He was educated from 1911 at the Collegiate School of St Peter, Adelaide (St Peter’s College), where he won the Farrell Scholarship. He was an accomplished sportsman featuring in rowing tennis and football. He was universally known as Richmond rather than his first given name. He served in the compulsory military service scheme in the cadet corps, under the Universal Training System. He served in the 11th Field Company Engineers in the militia. On leaving school in 1914 he joined the Adelaide branch of the Bank of New South Wales as a clerk. His address on enlistment was 113 South Terrace Adelaide. His mother, by then a widow, subsequently moved to 55 Park Terrace Unley. 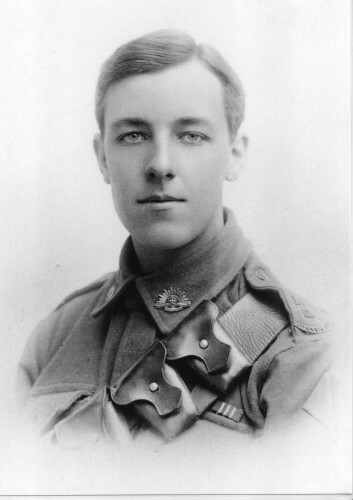 Richmond Baker joined the AIF on 29 July 1915. Allocated to the 1st Reinforcements of the 6th Field Artillery Brigade, he undertook basic training in Adelaide before proceeding to Seymour in Victoria to conclude his artillery training. (See image). He embarked on 22 November 1915 from Melbourne aboard the HMAT Persic A34 for the Middle East. In due course he was assigned to the 16th Battery of the 6th Field Artillery Brigade. (/explore/units/155) A battery comprised at that time four 18 pounder guns each with a crew of up to ten men, and drawn by a team of six horses. See the unit entry. The 16th Battery moved on from Egypt to France, arriving in time to take part in the first battle of the Somme. Having survived the massive artillery exchanges around the fighting for Pozieres and Mouquet Farm, the AIF found itself near Guedecourt for the winter. 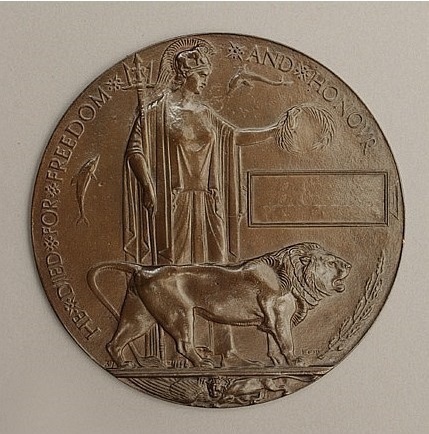 As a gunner Richmond won his first Military Medal on 15 December 1916 in an action near Gueudecourt. He was part of a Forward Observer team sent forward to direct the fire of the guns using a field telephone for communication. He repeatedly repaired broken telephone lines while under heavy fire. In June 1917 near Messines, he was awarded a Bar to his Military Medal when he and a small party of volunteers put out a fire in a gun-pit containing ammunition. Most men would have run for their lives. Richmond Baker had started by this time to direct his attention to his hopes of joining the Australian Flying Corps. Aerial combat captured his imagination. In August 1917 he remarked that he was 'almost green with envy' on seeing Allied aviators in action. He managed to secure a transfer as a mechanic in September 1917 to the A.F.C. He was identified and selected for flying training and sent to England to No. 5 Training Squadron. He ‘went solo’ in March 1918. On 15 June he graduated as a Sopwith Camel pilot and next day having been commissioned as a Second Lieutenant, he joined No. 4 Fighter Squadron. He had the sum total of 57 hours 40 minutes flying time. In a spectacular but tragically brief combat flying career lasting just four months, Richmond Baker's mark was immediate and profound. Between 23 June 1918 and 4th November (just one week short of the Armistice), he shot down a total of 12 enemy aircraft flying both the Sopwith Camel and its successor the Sopwith Snipe aircraft. Several of his victories were against the highly effective Fokker DVII biplane fighter. See the link detailing the tail numbers of the actual aircraft with which he was credited. He was clearly in his element; often he closed extremely close to the enemy he was pursuing. He had been promoted Lieutenant on 27 June 1918. But while life in the Flying Corps was exciting it was also very dangerous and on the 4th November he and two colleagues were lost in air combat over the town of Ath against a 'gaggle' of Fokker DVIIs. Lieutenant (posthumously promoted to Captain) Richmond Baker and Lieutenants Parker Whitley Symons and Arthur John Palliser fell to the guns of Jagdstaffel 2 “Boelcke”. The unit Commander Rittmeister Karl Bolle a very experienced German Ace himself had claimed the aircraft of Baker and Palliser. 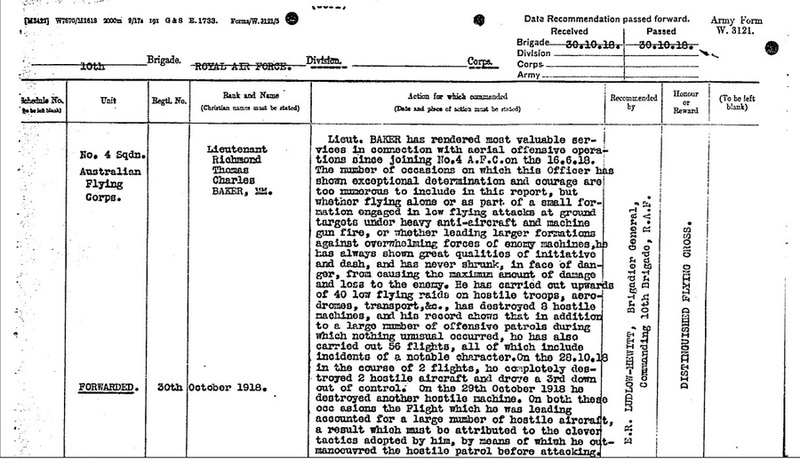 Award of the Distinguished Flying Cross and promotion to Richmond Baker were both posthumous; his D.F.C. citation is in an accompanying story panel. For such a young man he had displayed great qualities of leadership and personal courage. He was said to have had a forceful but pleasant personality, of his flying skill there was no doubt and was a steady, respected flight-leader. Among his effects there was an intriguing photographic self-portrait – perhaps one of the earliest “selfies”, taken while he was undergoing flight training. 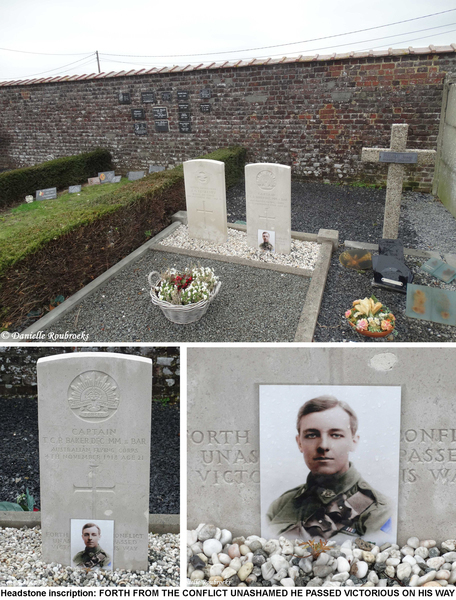 He was buried in the communal cemetery, Escanaffles, Belgium. A stained-glass window is dedicated to his memory at St John's Church of England, Halifax Street, Adelaide. Showing 4 of 16 images.